One of the key things to know in order to determine whether you should shoot a left or right handed bow is your eye dominance. 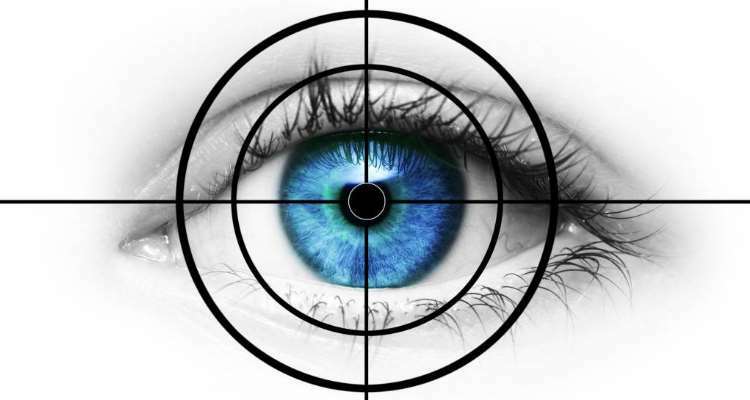 95% of people are dominant in one eye or the other and if you’ve never shot a gun or a bow before you’ve probably never noticed which eye! It is estimated that two thirds of the population are right-eye dominant and one third left-eye dominant, however there are a small number of people who do not have a dominant eye. Here are a few quick ways to determine which of your eyes is the dominant one. Just think about this, if you were to pick up a telescope and put it to your eye to look through, which eye would that be? If the answer to that question is clear and obvious and always the same that’s probably your dominant eye! The Miles test is where you extend both your arms and create a circle using the fingers of both hands and with both eyes open center the circle on a middle distance object. Now, close your left eye, does the object move or jump out of the circle? Yes? Then you are left eye dominant. Close your right eye, does the object move or jump out of the circle? Yes? Then you are right eye dominant. The problem with the above test is that if you focus to hard on the object, you see two sets of hands and you can’t center the circle, and if you focus on the hands, you see two objects!! Just try to be instinctive when you position your hands. You may also try extending both your arms, creating the circle, centering it on a distant object and then slowly pulling the circle back towards your face (keeping the object centered) until you find it covering one of your eyes, the eye you end up covering is your dominant eye! Another variation of the Miles test is the Porta test, this is very similar to the Miles test except you extend one arm and with both eyes open you align a thumb with a distant object. If you close your left eye and the object is still aligned with the thumb you are right eye dominant, and vice versa. 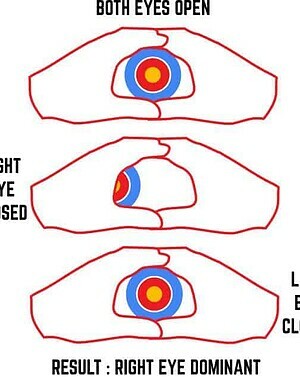 As with the Porta test you may also try extending your thumb, aligning with an object and then slowly retracting it towards you until you find it resting against one of your eyes (the dominant one). Again this method relies on you not thinking about that you are doing and just instinctively and naturally sighting an object with both eyes, you should find that subconsciously one of your eyes takes precedence. There is a possibility that you find that the object jumps or moves the same amount when you close either eye, or that your hands or finger end up covering your nose in this case you are one of the small number of people with no dominant eye. If you find you don’t have a dominant eye then you’re not the opposite of dominant, you certainly don’t have subordinate eyes!! You’re ambi-ocular, or you could call yourself third-eye dominant if you want a good line :). Lucky you! Don’t worry, you have more choices when it comes to determining which way you hold and shoot! Another suggestion for eye dominance check would be to stand in front of some one about three meters away and get them to point at your nose with both eyes open. Do it with both hands and see what eye their finger tip is over. The other way of using the miles test is to get them to bring their hands back to their face to look through the telescope and generally they will bring it back to their dominant eye.